As I have said previously I am not big on poetry, generally. This could be changing slightly as I have found another poet that I like. The poems here are his best work; not the propaganda poems which made up mych of his output as the ‘poet of the revolution’. They are really strong, visceral with an excellent turn of phrase and are exciting even, which is not the way most poetry is. If you combine reading these poems with the fact that he would have performed them at workers meetings and indulged in banter, humour and dealt with heckles then they take on another dimension as well. These poems are meant to be performed and by all accounts Mayakovsky was a larger than life character that commanded the stage. In the book one of the contributors compares Eminem to Mayakovsky and it’s not too far from the mark. This isn’t intellectual language, it’s strong language and Mayakovsky’s rhythmic genius has been deemed impossible to translate into English. But, still the contributors here have tried and to my eye and ear they have done a good job because you can sense the personality of Mayakovsky behind the words. Mayakovsky was full of contradictions. On one level as a futurist he wanted to destroy all that had been before but he couldn’t help but regard Pushkin as the greatest of poets. He was strong and anarchic yet seeming subservient to Bolshevism and his mistress Lili Brik (the Franz Ferdinand record cover with the loud-hailer is based on a Rodchenko poster that featured her). Mayakovsky wrote against suicide vehemently but then committed the act himself in 1930. Commentators have said that he may have seen the writing on the wall, several of his friends were being imprisoned under the beginnings of Stalin’s purges and it was only a matter of time especially since Stalin was not enamoured with him. Mayakovsky wouldn’t have survived the 30s it is fair to say. But as the revolution’s greatest poet he probably would have met the same mysterious end as Gorky who was arguably the revolution’s greatest writer. Nevertheless, his suicide was a turnaround from his previous position. This is a very good edition. 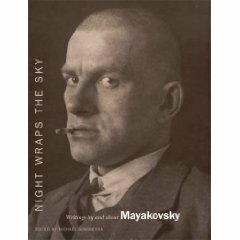 Along with the poetry you learn about Mayakovsky’s life through his own words in a biographical text called ‘I, myself’ and through extracts and reminiscences of those who knew him as well as contributors like John Berger. It’s a very good introduction and collection of his most known poetry; a ‘Greatest Hits’ if you like. I might have to track down the travel journal he wrote about his visit to America – that should be interesting as well. He also wrote and acted in movies, though only one full one survives, and worked with Rodchenko on posters and slogans. So, a renaissance man. This is definitely well worth reading, highly recommended, Mayakovsky’s work is still relevant and powerful 80 years after his death. This entry was tagged Mayakovsky; Vladimir. Bookmark the permalink.